Labrador Retrievers are the most popular breed in the U.S. and in addition to making great pets, are commonly used as working dogs for hunting, seeing-eye dogs, and therapy dogs. Labradors carry a particularly large burden of genetic diseases, including diseases that can affect young pups. One such disease is Pyruvate Kinase Deficiency of the red blood cells (PKD). Symptoms may present as early as 2 to 3 months of age, presenting after the puppy has been purchased and delivered to their new owners. Affected dogs have a hemolytic anemic that results in fewer red blood cells. 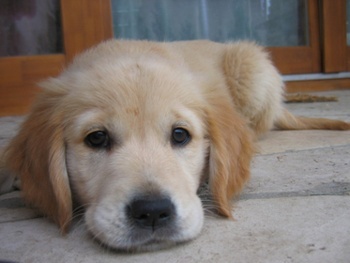 The affected dogs tend to be smaller and weaker than their littermates. Other symptoms include exercise intolerance, pale mucous membranes, fast heart rate and heart murmurs. Enlargement of the spleen and liver is usually present by a year of age, and bone marrow and liver failure may occur by 5 years of age. Bone marrow transplant has been successful in treating the symptoms in affected dogs, although the cost prohibits this treatment in most affected dogs. Genetic testing of the PKLR gene in Labrador Retrievers is available. Because this disease is inherited in a recessive manner, the mating pair may be carriers and unaffected but will result in 1 in 4 pups with the disease. Genetic screening should be performed PRIOR to breeding so that proper pairing can be achieved to avoid the disease in puppies. If testing was not performed in the parents, any Labrador puppies should be tested PRIOR to purchasing.